Jigme Rinpoche was born in Derge (East Tibet), brother of the 14th Sharmar Rinpoche and nephew of the 16th Karmapa. When the 16th Gyalwa Karmapa Rangjung Rigpe Dorje left Tibet in 1959 with a retinue of many high Lamas and Tulkus of all ages and went to Rumtek (Sikkim), Jigme Rinpoche also accompanied him. Arriving in Rumtek, the 16th Karmapa extended the monastery to preserve the precious teachings of the Kagyu line. 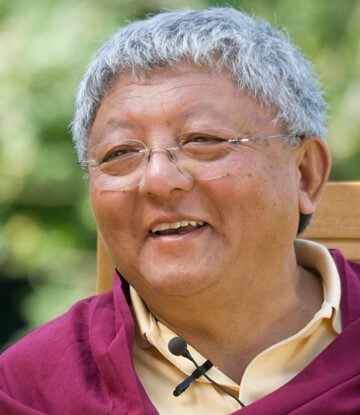 Jigme Rinpoche studied the totality of the Buddhist canon under the guidance of various masters, and in particular the teachings of the Karma Kagyu Lineage, which he received the transmission of. From 1961 to 1970, Jigme Rinpoche was Karmapa’s assistant to the Karma Kagyu lineage and, in his absence, took care of the monastery in Rumtek. In 1974, during his first visit to Europe, he was appointed head of Dhagpo Kagyu Ling, his European headquarters in the Dordogne/France, by the 16th Karmapa. Karmapa said: “In the person of Jigme Rinpoche I give you my heart”. Jigme Rinpoche continues his activities worldwide, visiting centres and inspiring all those who come into contact with him. The 17th Gyalwa Karmapa Thaye Dorje has appointed Jigme Rinpoche as his deputy in Europe at an early stage, and in 2012 he will also be his Secretary General. Jigme Rinpoche inaugurated the Dharma Center Möhra in September 2005 and has been visiting it regularly ever since. In addition, Jigme Rinpoche has been chairing the Dharma network meetings of the German-speaking Dhagpo-Kagyü Mandala since 2001, which have been taking place here in Möhra continuously since 2005. In 2014, Jigme Rinpoche inaugurated the foundation and guest house of the Karmapa Foundation Möhra.